In my country — India — God is everywhere. At school, at work, even in a taxi ride, the average Indian encounters God in a million daily interactions. Instead of steering away from religion, we steer toward it without hesitation. And “religion” here doesn’t always look the way you might expect it to. Recently, I spent Shabbat in Ahmedabad. On Friday night, the sun had just set when I heard the synagogue’s hazan begin to chant the Kabbalat Shabbat — and, a second later, the call to prayer from a nearby mosque. Not only were we praying at exactly the same time, but the melodic muezzin sounded just like the Iraqi Jewish prayers I hear at my regular Mumbai synagogue, Knesset Eliyahoo. The call to prayer was not an exclusive call for only one people, although it was meant to be. With open hearts and prayerful minds, we heard it as a call to prayer for all listening. This is what it means to me to be Jewish in India: The idea that multiple faiths can peacefully intermingle not only doesn’t shock us, as it does for some in the West — it’s actually taken for granted. And although some Westerners may not imagine it perfectly normal and natural to be a Jew of color, growing up Indian has been a great benefit because it’s exposed me to this model of diversity. The religious diversity that exists in India, I believe, shows a lot of promise. But diversity is not the same thing as assimilation. In fact, it can only be achieved if we do not assimilate. We have to maintain our separate religious identities, because without separate identities any talk of diversity is meaningless. So, how do you integrate but not assimilate? In India, adherents to Hinduism, Islam, Christianity, Jainism, Buddhism, Zoroastrian and Judaism are all connected and united by virtue of their Indianness. The religious minorities have figured out how to be the “sugar in the milk,” to quote from a story about how the Parsees (Zoroastrians), fleeing persecution long ago, first came to India. According to the tale, the king was very concerned that these Parsees could turn out to be missionaries. The Parsee leader said: “We will be like sugar in the milk. Sugar dissolves in the milk and adds sweetness, taking up space that is available for it to occupy.” That has effectively been the story of minorities in India. As a Bene Israel Jew, I am a religious minority here. And what makes me proud about being relatively religiously observant in this country is how we Indians continue to study together as students, live together as neighbors, eat together as friends — yet not stray outside the religious boundaries set for ourselves. My engagement with the world outside my Jewish home is critical — it enriches my own tolerance and empathy, skills that I sometimes need to use even with my fellow Jewish community members. 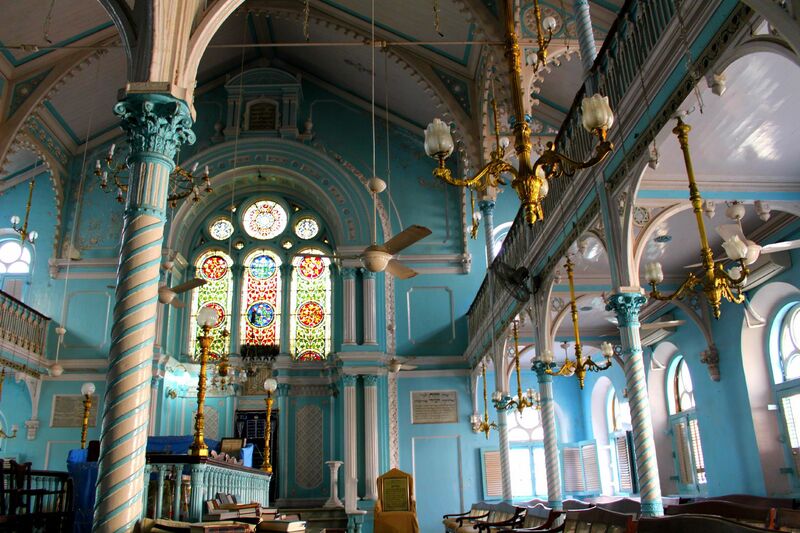 Bombay Blue: The interior of the Knesset Eliyahoo synagogue. But Jewish life in India is not just a culture that has been thriving for two millennia and counting. It’s also a vision for the future of the whole Jewish people. In the coming months and years, India is going to attract more and more Jews who are coming as academics or for business. Being Jewish in India may become the experience of not only the resident Jews but also the expat Jewish professionals who will make India their home. The question of “What does it mean to be a Jew in India?” is stretching its wings now, in a way that probably happened in America 100 years ago. This country’s approach to coexistence is so profound that I hope it will make us all realize that there truly is one God. That we can pray together, that we can pray for each other, and that we can ask others to pray for us is a deep message — especially since we’re located only eight hours away from the Middle East. Can this land of many faiths, which allows each group to thrive within its own individual faith, be a model for Jews around the world?